a place for cleveland's writers and readers: Books so good you can eat them. Really. Books so good you can eat them. Really. Sometimes there's a book that's just good enough to eat... and then there are edible books. That's not an April Fools joke. This Saturday, Loganberry Books on Larchmere is sponsoring the Edible Books Festival. Saturday, April 6, 2013-- set-up begins at noon, with viewing and voting at 1:00, awards announced and books consumed at 2:00. 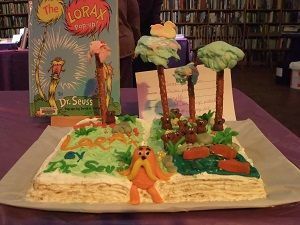 Make your own edible book, and win! Or just go for the show. Viewing is free, but there's a $3 fee for voting and eating of the Edible Books. Oh, and hey-- it's a bookstore, so you can buy non-edible books (the paper kind) while you're perusing the edible kind. What could be more cool than that? --if you miss it this year, mark your calendars: Loganberry's been having an edible book festival on the first Saturday of April every year since 2004, so mark your calendars for next year! The book of cats: "On Velvet Feet"